With official unemployment rates in 2014 running at 17.6% and 12.4% in Armenia and Georgia respectively, a World Bank analysis in both countries suggests that the labor markets of these countries suffer from a skills shortage. The World Bank’s STEP Skills Measurement Program gathers information on the supply and distribution of people’s skills, and the demand for these skills in low-income countries’ labor markets, interviewing a representative sample of adults aged 15 to 64 living in urban areas. 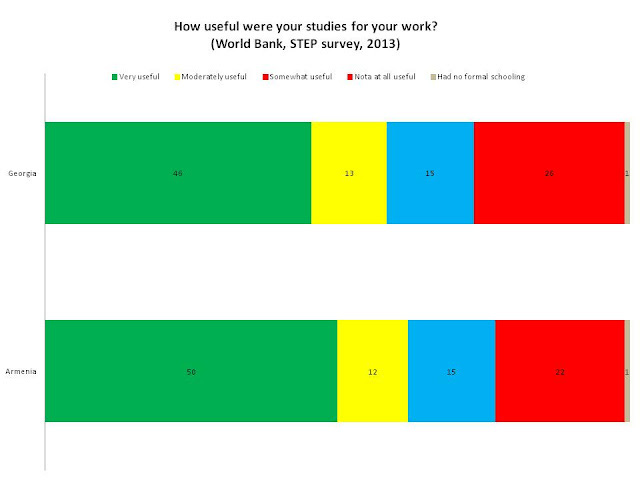 This blog post looks at the World Bank’s STEP data for Armenia and Georgia, which CRRC collected in 2013, to see how people are finding work, their confidence that they have the skills needed to find work, and how they feel their education prepares them for work. Interestingly, in both countries, a plurality of employed people reported relying on their social networks (friends/relatives/other) to find a job (37% in Armenia and 45% in Georgia). Also reflecting the informal nature of the job market in both countries, the next most common method was to contact the employer directly: 26% in Armenia and 18% in Georgia. Note: The chart presents only answers of those who reported they had worked in the previous 7 days and shows the percentage of those reporting having used a given method. Both employed and unemployed were asked whether they thought they possessed various qualities or knowledge that would help them when looking for work. People appear to be very confident in respect to certain skills – for example, 92% of Armenians and 81% of Georgians thought they would perform well in a job interview. However, the share of those who felt they had the necessary work experience was much lower – 60% Armenians and 58% Georgians thought so. In both countries, few believed they had the means to start their own business: 7% in Armenia and 13% in Georgia. Note: The chart shows only the percentage of those reporting having a given skill or resource. Only around half of those who had worked in the week preceding the survey (42% in Armenia and 37% in Georgia) think their formal studies were “very useful” for their job. The rest, however, are not so sure about this. Further analysis of the World Bank data could help to uncover whether this is because people’s skills are being underutilized – for example, by having to take jobs that are at a lower skill level than they are qualified for – or if they believe their education does not provide job-relevant skills. Potentially, there could have been other reasons as well. The full STEP survey datasets for Armenia and Georgia are available from the World Bank website.